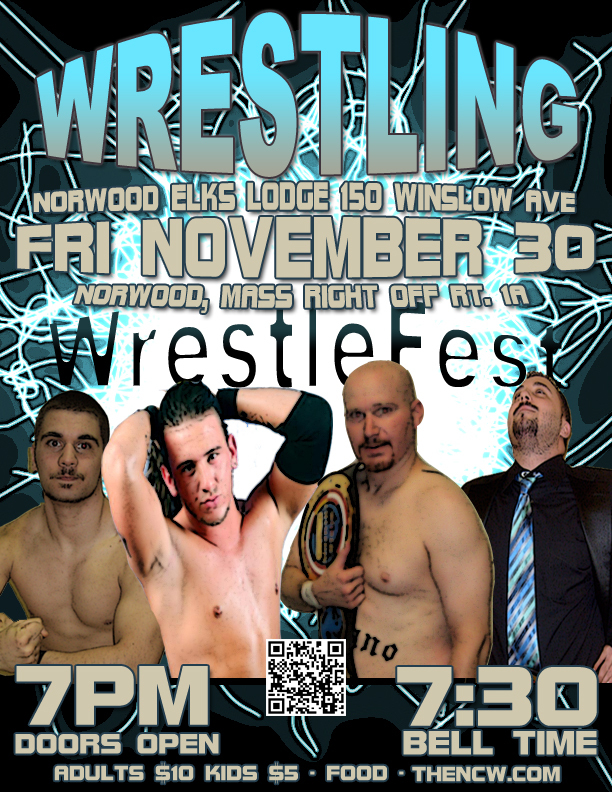 This Friday night Northeast Championship Wrestling returns to the Elks Lodge in Norwood, MA for the final event of the 2012 wrestling season when NCW presents WrestleFest VIII. All three major championships will be on the line at WrestleFest, in addition to the 2012 Season Cup Match. 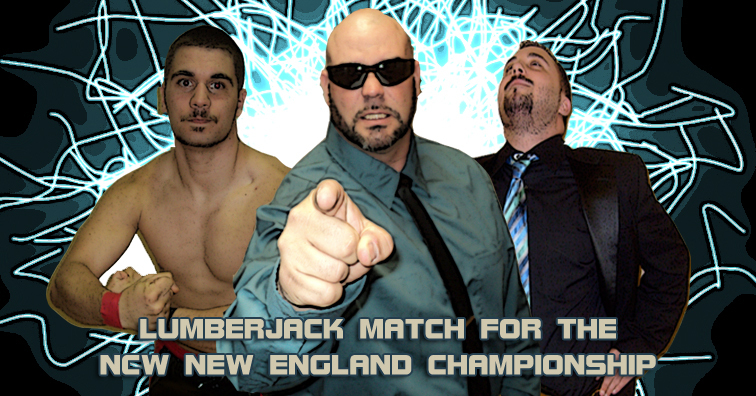 While the night’s Main Event will feature Buddy Romano defending the Heavyweight Championship against former Champion “The Juice” JT Dunn in an I Quit Match, the reigning New England Champion “The Original Showoff” Mike Paiva will put his title on the line against “The Insider” Kevin Perry in a Lumberjack Match. 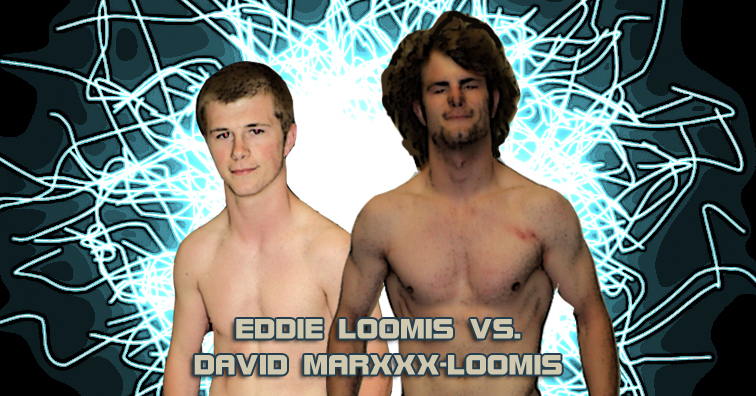 The Loomis Brothers will collide in another WrestleFest classic, this time with Eddie’s pride on the line as he attempts to prove himself against his older brother David. “RIOT” Kellan Thomas goes against his rival Scotty “By GOD” Vegas in an expected war while the BLT look to retain their Tag Team Titles in their toughest challenge to date. The Norwood Elks Lodge is located at 150 Winslow Avenue in Norwood, MA directly off of Rt. 1A. Doors open for this event at 7pm with a 7:30pm bell time. Tickets are only $10 for adults and $5 for all kids twelve and under. 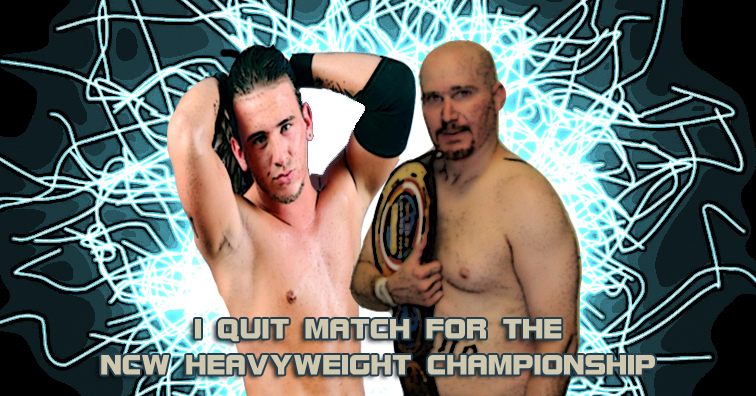 On November 30th the careers of Buddy Romano and JT Dunn will collide one final time when both men step into the ring at WrestleFest VIII to battle for the NCW Heavyweight Championship, this time in an I Quit Match. After winning the vacant NCW title in the REUNION Championship Tournament Dunn’s reign as champion lasted of all of a month when JC Marxxx and Zero Tolerance ensured that Romano regained the title by any means necessary in their West Warwick Street Fight at NCW Spring Slam. Since then Buddy has kept a stranglehold on the championship, holding back challenges from “RIOT” Kellan Thomas, Steve “The Turtle” Weiner, and even his own Zero Tolerance partner David Marxxx-Loomis while ducking “The Juice” at every turn. Dunn would not be denied however, winning his final championship opportunity at TOTAL ELIMINATION, winning three matches in one night en route to becoming the #1 contender for Romano’s title at WrestleFest. At the Final Countdown in Foxboro, JC Marxxx accepted Dunn’s challenge for the I Quit Match at WrestleFest, truly believing Romano could defeat “The Juice” in Norwood. Confident in his client’s abilities Marxxx then put his own career on the line, placing all his odds on the NCW Heavyweight Champion in Norwood. 1,231. One thousand two hundred and thirty one days. Over three years as the NCW New England Champion. Mike Paiva has had an unprecedented reign as champion, but on November 30th all the running, hiding, cheating, and manipulating could finally come to an end when “The Original Showoff” defends the New England title against “The Insider” Kevin Perry in a Lumberjack Match with Commissioner Dean “The Beast” Livsley stepping into the ring as the special guest enforcer. No matter what happens in the end Livsley proved that he was smarter than anyone gave him credit for when he orchestrated Kevin Perry to become a mole inside Zero Tolerance, at the expense of his friends, family, and fans. Working as Mike Paiva’s protege for an entire year, Kevin learned all of Paiva’s tricks without “The Original Showoff” ever realizing his own imminent downfall. When the other foot dropped at TOTAL ELIMINATION, the house of cards that Zero Tolerance had built since their return in 2011, perhaps setting the stage for Mike Paiva’s final night as champion. While it has been Doug Summers quest to become NCW’s first Triple Crown Champion and win the Tag Team Titles with his best bud Steve “The Turtle” Weiner, the former Heavyweight Champion was crushed to see Ruy Batello & the Lumberjake win the vacant titles at NO FEAR after nearly walking away with the belts himself. Doug’s obsession with becoming Tag Team Champion has seen a decay in his moral compass, willing to take short cuts he avoided in the past while using Steve to his advantage in any way. The team of Pacifico & Big Bully Rezner has seen these two psychopaths struggle to maintain dominance, using bullying and backstabbing to make their mark on the tag team division this Season. 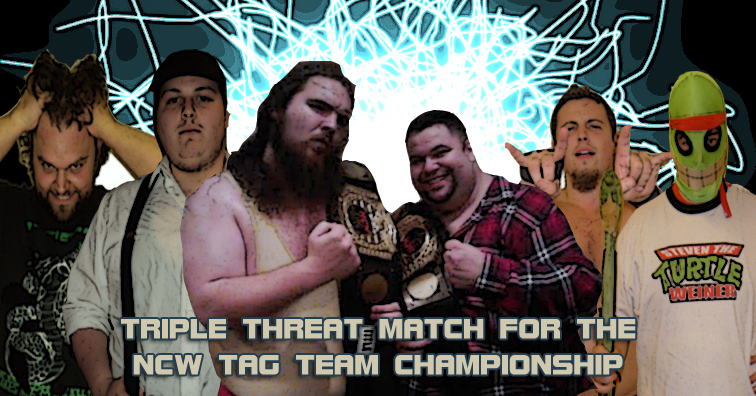 At WrestleFest the Big Lovable Team will defend the NCW Tag Team Titles in their toughest challenge yet when “The Portuguese Sensation” & the 2011 Rookie of the Year go up against both The Super Rad AND Pacifico and Rezner. Since joining NCW in 2005 the amateur standout David Loomis has always lived by one motto. Winning. Aligning himself with his adopted father JC Marxxx, winning two NCW Heavyweight Titles, retiring Dean “The Beast” Livsley from the ring, these are the accomplishments of a winner. And while David has always been at odds with his youngest brother Eddie since Eddie’s debut in 2010, a tinge of family pride deep within David has yearned for Eddie to step up his game and become more than a fan favorite to the NCW faithful. After being forced into a tag team match with each other at TOTAL ELIMINATION, which saw Eddie fall victim to a Ruy Batello splash, the elder Loomis has become incensed with disappointment, challenging his little brother to fight him one more time or hang up his boots for good. Can he do it? Can he win? When “The Maniacal” Jack Krueger eliminated Cenobite from NCW at the 15 year REUNION, the deranged one believed a new era was dawning upon NCW with him at the top of the mountain. Recruiting “The Twisted Hatter” Alex Creed to join him, it was “The Juice” JT Dunn and an NCW referee named Anthony Greene that tore it all down for Krueger, sending him back to reality and forcing him to once again face his demons. After losing a tag team match to Dunn & Greene at NCW FALLOUT, a frustrated Jack Krueger took fate into his own hands once again when he brutally attacked AG with a chair, causing himself to serve out a 30 day suspension. At WrestleFest Krueger looks to regain his lost power when he goes one on one with Greene this Friday night in Norwood. Don’t get between a man and his puppet. After “RIOT” eliminated both himself and Scotty Vegas in 2012 Big City Rumble this past August, a perturbed Vegas took his frustrations out on Kellan’s good “pal” “RIOT” Kepler Thomas, the lovable puppet Thomas brings with him to ringside. Things only intensified when Scotty eliminated “RIOT” from the Total Elimination Finals in Norwood last month, setting the stage for their one on one encounter November 30th at WrestleFest. This Season has seen “Simply the Best” GA West struggle to reach the top of the NCW mountain, coming so close but never reaching the breaking point. Since nearly winning the 2012 Big City Rumble West has found himself at a loss, looking for anything to get him back on track and back into title contention. At WrestleFest West will go up against the former NCW Tag Team Champion Todd Sople, another individual who finds himself at a crossroads after his tag team partner Gunar Rowe left the promotion due to injury, forcing Sople to forfeit the Tag Team Titles. The Season Cup has always been a breakthrough match for many of the young up and comers of Northeast Championship Wrestling to make an impact and establish themselves as a force to be reckoned with for the upcoming year. It’s also been a place where some of NCW’s most popular fan favorites have come to stake their claim as NCW’s best of the best. This Friday night in Norwood a mix of both will enter the elimination match with one goal in mind– victory.